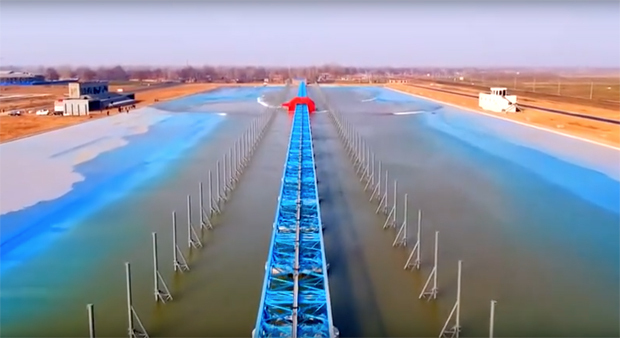 Not a whole lot of detail on this yet, and the waves in this vid don’t look so big (yet), and it all looks a touch dodgy compared to the Wave Ranch, but it is really long, and it’s a nice colour . . . and with surfing now an Olympic sport, who knows where all this is heading . . . ? The Chinese government are making big investments in surfing lining up for the Olympics as they did with gymnastics and snow sports. China is investing billions of dollars into new ski resorts, skating rinks, and athletics programs to help it win big in the 2022 Beijing Winter Olympics. The country wants to build 800 ski resorts and 650 skating rinks by 2022, when it will host the next Winter Games. They have even hand picked 22 athletes from other sports paid them to swapped sports to try ski jumping with the aim of making Beijing 2022 and sent them to Norway to train from scratch. If they see opportunities in surf could we see Chinese surfers on the WSL? Could just be a matter of time.